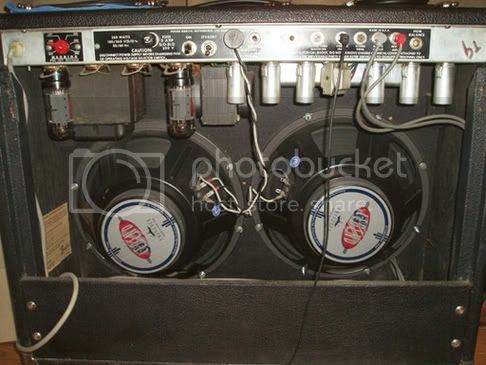 Discussion in 'Amps/Cabs Tech Corner: Amplifier, Cab & Speakers' started by alderbody, May 18, 2006. This is the schematic of my amp (135W MV twin reverb). In case i want to replace some caps in there, which ones would make a difference? Some people say that there's no clearly audible change if i replaced the ones in the tone stack. Not even the ceramics with silver micas? Could someone pinpoint the coupling caps, or any cap that could be replaced? I'd like to go with Mallory 150's because i really like them in my custom built pedals, although they are mostly suited for "Marshall type" amps. Not trying to be a smartass but this is one of those cases where "if you don't know you probably shouldn't be messing with it".If you must ,you should first make sure the filter caps are all good.Then figure out what you want from the amp and proceed from there in place of just blindly changing caps. 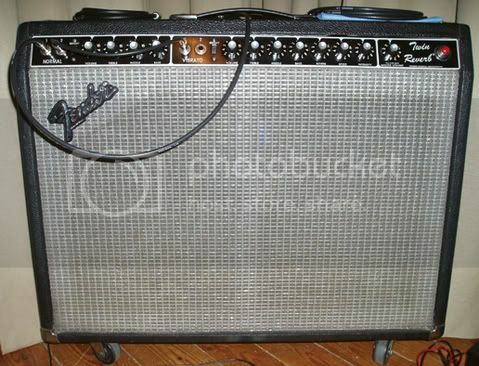 What kind of changes would you like to see in the amps tone?What are you trying to do with it that it won't do? I wouldn't change a thing in that amp. If you have a Black or Silver amp (or a Rivera built version), you already have some great caps in there. Nothing wrong with Blue Drops at all. Mallory 150s are very neutral sounding. Orange drops are more refined and hi-fi. SoZos are more British sounding with a darker and smoother tone (with a little graininess mixed in just for fun). Just play the sucker and don't worry about the caps! The filter caps have already been replaced a couple of years ago. Also, the Ultra-Linear feature of the OT has been removed (that's what the tech said) and some other minor tweaks were done. The amp doesn't like most of the pedals and when treble is increased i get a flat, harsh and metallic tone. Not quite musical in any way. I know that the secret in tone about these amps lies in the OT and power supply area, but i thought about "sweetening" the voice a little. (i can't easily find another), i plan to replace the OT with a less powerful one and remove the wiring for the two 6L6's. Thanks for the tips on caps! I was already familiar with the mallories and the orange drops. The sound of the OD's is indeed quite Hi-Fi, at least for me. I seem to have found my match in the Mallories after many tests. If you read the above post you'll see why i started this thread. undoing the tweaks the tech has done (except the de-UL) and get an attenuator in order to be able to crank the amp. If anything I'd say it sounds harsh because of the presence of a capacitor tapped onto the master volume. I can't read the component value or designator on your schematic.